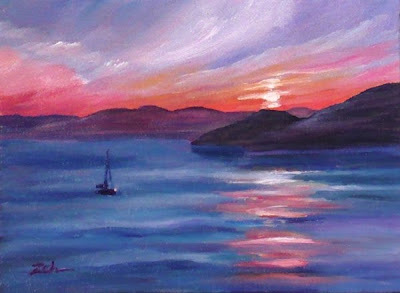 The sun sets bathing the sky with crimson and washing the far island hills with a reddish glow as a small boat heads home. This painting is sold. See my other artwork for sale on my website: www.zehoriginalart.com. Thanks for stopping by and have a beautiful day!